SANTA FE, Texas — As many as 10 people were killed in a shooting Friday morning at a high school south of Houston, law enforcement sources confirmed to CBS News. 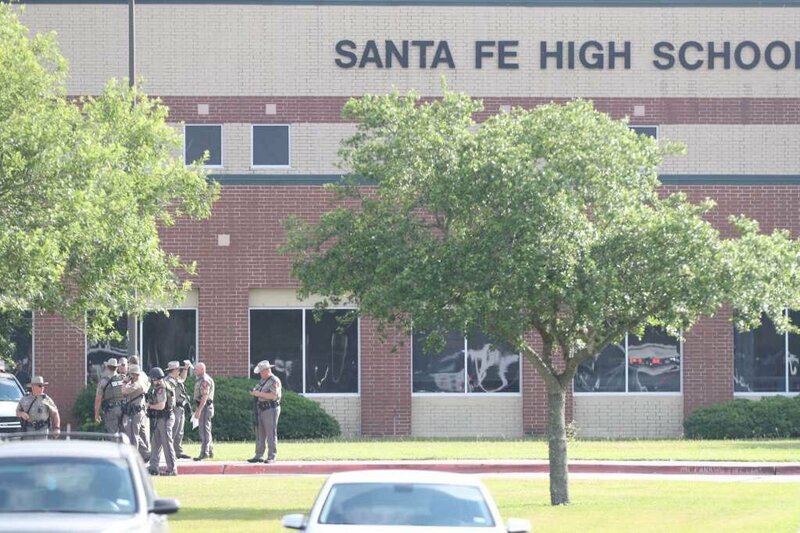 School district Police Chief Walter Braun said that explosive devices were found in Santa Fe High School and the surrounding area. Two students and a school resource officer were shot and injured in the shooting, CBS News has learned. Another law enforcement officer was also injured but was not shot. “Black trench coat, short kind of guy, had a sawed-off shotgun,” Damon said. The substitute teacher then pulled the fire alarm in the hopes of alerting students and faculty in other areas of the school and getting them to evacuate. Tyler Turner, a senior at the school, told KHOU-TV that his friend saw “some kid” with a gun. When teachers and students were outside after the fire alarm was pulled, shots were fired, Tyler said. Santa Fe High School student Dakota Shrader is comforted by her mother Susan Davidson following a shooting at the school on May 18, 2018, in Santa Fe, Texas. Students from the high school were being transported to another location to reunite with their parents. A parent told CBS affiliate KHOU-TV that some students were evacuated to an auto shop near the campus. Aerial footage from the scene showed students standing in a grassy field and three life-flight helicopters landing at the school in Santa Fe, a city of about 13,000 residents roughly 30 miles southeast of Houston. In Washington, President Trump initially reacted to the shooting on Twitter. “School shooting in Texas. Early reports not looking good. God bless all!” Mr. Trump said.